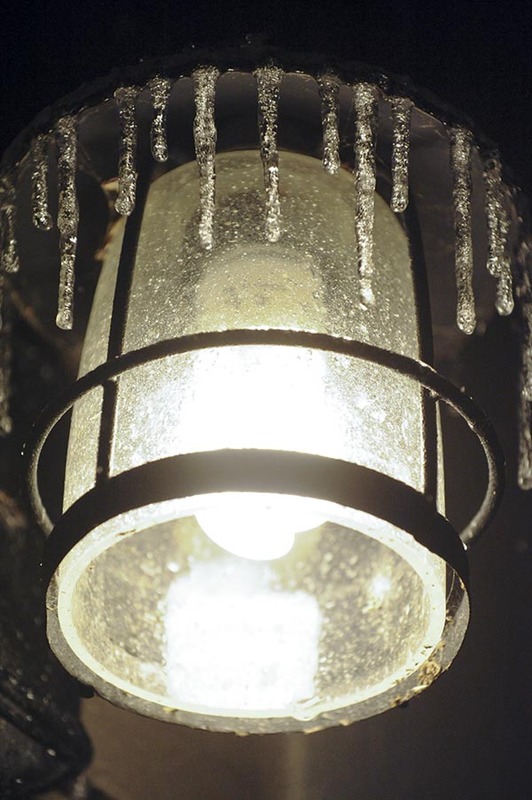 Photo By Paul Purpura : ©2009 www.nelsoncountylife.com : Ice coats a light at Three Ridges Condos on the mountain at Wintergreen Resort late Tuesday night. While temps in the valley regions of Nelson County, Virginia continue to hover just above freezing Tuesday night, temps in the upper elevations of the county were in the mid & upper 20’s with continual freezing rain falling. At 9:30 PM Tuesday night our Wintergreen Nature Foundation Weather Station showed a temp of just under 28° at the 3500 foot elevation. Click for larger view. To see current temp anytime at the Devils Knob NCL station simply scroll down below the radar and look on the right side of this site under our NCL Station here in Afton. Our Paul Purpura grabbed the shot of the ice on this light and told us there was lots of ice on the mountain shortly before 10PM Tuesday night. “There is a good quarter inch or so on the sidewalks, but it is kind of powdery. It crunches when you walk on it. Sort of like a mix between ice and snow. The Hemlock in front of my place is sagging,” Paul told us via AIM Instant Messenger as he was uploading his photo to our office. Overnight temps are expected to gradually warm during the pre-dawn hours with the freezing rain changing to plain rain by daylight. Temps will be around 50° on the mountains Wednesday and the upper 50’s valley. Heavy rain is anticipated in the early morning hours Wednesday. A clap of thunder is possible as well as the system gets nearer. Click here to see various winter weather advisories and flood watches that remain in place until the early morning hours Wednesday.